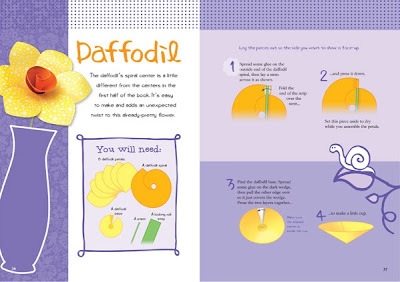 Fabulous Flowers - Klutz Book Giveaway! I'm a longtime fan of Klutz books for kids... the projects are appealing, directions are clear, and the supplies, always top notch. 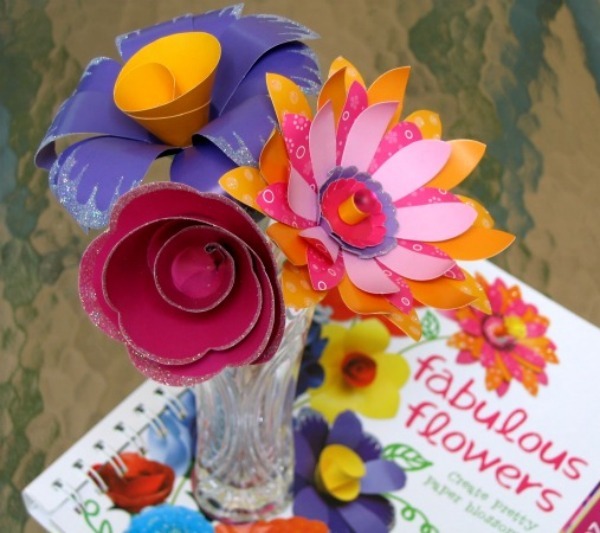 A new title, Fabulous Flowers: Create Pretty Paper Blossoms, doesn't disappoint. In fact, I bet I enjoyed making the rose, cosmos, and daisy you see here as much as any elementary school student. See the glittered edges and lovely sheen on the paper? Fear not... the glitter doesn't rub off/get all over everything, and the durable paper is just as nice to work with as it looks. Klutz says, ""Let your creativity bloom with this book of can’t-go-wrong instructions for life-sized, dimensional, paper blossoms inspired by our favorite flowers: roses, daisies, daffodils, hibiscus, zinnias, cosmos, poppies, and larkspur. Sparkly embellishments, fresh paper colors, whimsical design variations, and a custom shaping tool give these blossoms a twist that’s pure Klutz — and quite possibly, even prettier than the real thing." 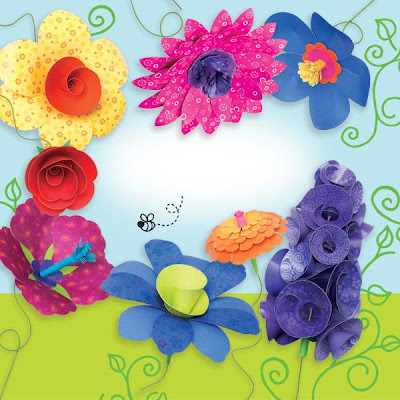 "As always, Klutz has packaged the book with everything you need to get started: 20 pages of ready-to-punch-out paper petals, sparkly flower centers, wrapped wire stems, glue, and of course, the custom winding tool - enough stuff to make bunches of flowers." Watch a quick videoclip here that shows some of the flower types. Anne Akers Johnson, author of quite a few Klutz titles, has written clear instructions for a variety of well-known flowers. All necessary supplies are included except for scissors, wire snips (I just used a pair of sturdy kitchen shears), and something in which to display the finished flowers. I'd also recommend keeping a damp cloth close at hand to wipe fingers - this will definitely make things less sticky. 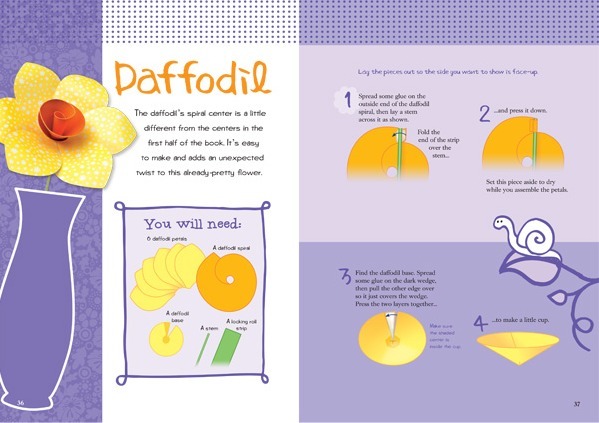 The book is suggested for ages 8 and up, but it will be necessary for the youngest flower makers to have an adult or older child close by to guide the process and supervise the snipping of the wrapped wire stems. Each stem has curled ends that must be cut off before using... those tiny bits of sharp metal can go flying if one isn't careful. Creating the flowers will teach patience, as some steps require that the glue be completely dry before moving on to the next one. As with any paper project, I found that practice makes perfect - my second and third flowers went together more easily and quickly than the first. So share this book with a child you love or keep it for yourself! There's no doubt in my mind that crafty adults will enjoy making the blooms as much as children. Paper flowers make terrific party decor and package wrapping embellishments. Once all twenty flowers have been made, trace the templates and create your own out of any light to medium weight paper - for example, crepe paper or patterned scrapbook paper. Old map and book page flowers would be trendy. Handmade blooms will beautifully decorate a bridal or baby shower, and they even have the potential to be carried as a playful wedding bouquet. I received a copy of Fabulous Flowers for review purposes and Klutz is offering two All Things Paper readers the chance to win a copy. Leave a comment to enter. For additional chances to win, spread the word about the giveaway via a blog post, Facebook page link, or Tweet, and/or on any craft forums. Tell me if you've done so in your comment. The giveaway ends at the end of Saturday, June 11. Winners will be selected by a random number generator and announced the next day on this post. Good luck! P.S. I can't tell you how nice it is to have a bright and cheerful bouquet on the table that doesn't contain sneeze-inducing pollen! Update: Congratulations to Claire, comment #67, and lokokina, comment #78, as selected by Random.org. Thanks to all who entered! I always enjoy your comments and appreciate that we share an enthusiasm for paper. Even if you didn't win this time, take heart - there will be another giveaway coming up soon! the flowers are really adorable, and the book would be great for children, thanks for sharing!!! your flowers are really cute, and my children would love this book ! I think I gave them the paper mania ! What an amazing range of flowers.. the brightness of it blinded me for a minute.. very very cheerful... Love them.. !!! Just made a blog post about the candy.. you can check it here. just posting it on fb too...!! I lov all kind of paper flowers. It would be great if I could learn a little more!! Lovely bright flowers! I love making paper flowers. Thanks for the chance Ann. I have mentioned the giveaway in the side bar of my blog. Oh, I love the Klutz books! This book looks like more fun than the flower-making packs they have at PaperSource, etc. So many varieties! Klutz books are the best! They are well thought out, clear directions and great supplies. I used these with my children and now still use them with my grandchildren. Love them! I tweeted this giveaway also! so colorful, so fun, so can't wait to give one to niece and nephew! I love paper flowers. This looks like a fun book for me and my kids this summer. I think these would even make the loveliest posy bouquets for a flower girl or even a bride in white. Awesome!! I shared this link on Facebook as well. That is exactly my style and my colors, thanks, I love it...! So cute! I happen to LOVE Klutz books. Have a few of my own, yup, NOT for my kids ;) LOL! Their directions and ideas are always so simple and colorful. Thanks for sharing. 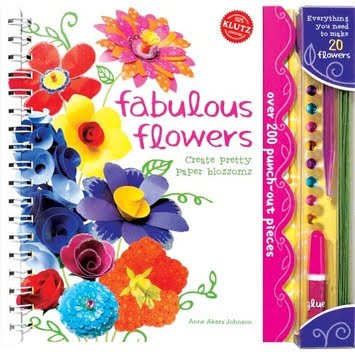 Those flowers look really fun to make- I've also been a fan of klutz books in the past. I'd love to win a copy- thanks for this giveaway. My daughter always wants to "craft" with me when I'm making my flowers. This would be a great starter for her! I love reading your blog! I find myself visiting it at least 3 times a week... and it's always very inspiring. oh sneeze free flowers would be wonderful :) I posted on facebook. looks like a great book! Thanks for sharing your review and projects. i would love to have this ! i love flowers and making them will be more fun ! I love Klutz books! It's been so long since I've had one!! oh how sooo pretty ! !i'm already a punchcraft addict n this bok will b an icing on d cake !! 'm all for it !! This would be so much fun with my nieces age 4 and 7! They are soooo crafty! how nice it is ! i hope i could win it !! This looks like another great book! 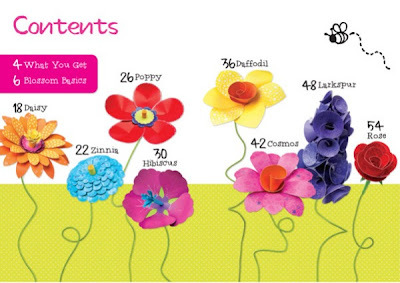 My granddaughters love their book and I'm sure they would love to make all these flowers! Thanks for the opportunity to win one! I'd love to try these flowers, since I don't have a green thumb. They look gorgeous! I love Klutz books and I even own some. I don't have this one though and I love those flowers. So I hope that I win. 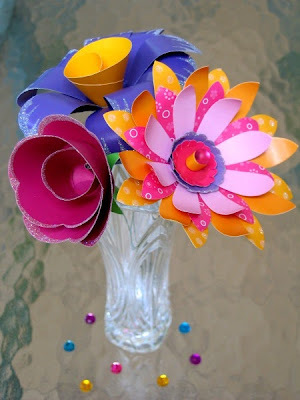 I would love to learn to make these flowers... this is amazing!!! I love Klutz books. They are so fun. I have several. I love Klutz and I love All Things Paper! the book & flowers looks very bright! would love to have the book!!! This book would be great for children. My girl would love the simple instructions. I started quilling with their book "Twirled paper" and that one here seems to be so nice for learning to make these lovely large flowers. This looks great! Thanks for the opportunity to win this book! This books are great! Thanks for the opportunity to win this ! I love Klutz books too...I buy them for my little niece...but I wind up keeping them myself LOL. This one I really know I would keep....I WANT it! Please pick ME! Oh, I so enjoy your blog. It always inspires me! Beautiful flowers, and I love the fact that everything is right there to finish them all. Would love to win this! Klutz Books are for kids? Lol, I love Klutz Books, I do alot Kids Craft Classes, and there are alot of adults who will sign up for the classes, but want to do them without kids in them! Not because they don't like kids they don't want the kids to show them up! So their books make it fun for both adults and kids to learn. I don't have this book, and love paper flowers! So please enter me in the drawing!! Thanks!! Hi, have been following your blog for quite sometime now. Am all inspired by every new post of yours and this is no exception. The flowers look fabulous and its a must try. I would love to have that book guiding me make those fabulous flowers. Cheers! LOVE this! this is the perfect summer activity ☺ happy day to you! Oh! Enter me! My sis and I would love to do that! Well kids might like this but I like it more!!! This is something I gotta have. Thanks Ann! I love those flowers! The best kind...no sneezing and there is no way to kill them!!! I have always loved Klutz books! Thanks Ann, it's a great book! Glad to see all things paper on fb now too! I love the klutz books....especially twirlled paper. I managed a book store for many years and am old enough to remember the original juggling klutz book when it came out and the books were a hit from the start. It is my birthday on saturday so maybe that will give me extra luck...as well as blogging and tweeting about it. The first and only quilling book I could find at Michael's store, was a Klutz book, titled, "Twirled Paper", by J. Lee. This looks like so much fun! I'd love to make some of these flowers with my niece! wow these are so cool! thanks for the chance to win the book! Looks like an awesome book, and thanks for the chance to win! wow, this book looks awesome..Looks like something I could do with my school kids. These look both pretty and fun. Thanks for the giveaway. I've always loved the Klutz books! That is really neat! I love fun craft ideas like that. Thanks so much for the giveaway! Thanks for the great giveaway----my daughter and I would love to make these flowers during a rainy summer-break day! I posted your giveaway on my blog, check it out! I KNOW my 10 year old would love this...I will too...too adorable and fun! Lovely flowers! I love Klutz books. I have some Klutz books of my own. They are great for any age. Cute! My sister would enjoy this. I'd love to win this to do with my niece on a rainy summer day. Welcome to Facebook. Now you'll know what comments are! I would love to win the book, firstly for my own paper making skills and then to pass on the joys of paper manipulation to children and young adults. You'll find a picture with link in my blog. There is a candy in my blog too.. I would love to win this book! I would use it in my work with children and adolescents with mental health issues. Klutz books are great! This would be fun to give as a gift. My children would love this! What an awesome idea! Thanks for the giveaway! These flowers seem very adorable. I love paper flowers, because I am allergic to natural flowers. Your website continues to be a source of inspiration for me... 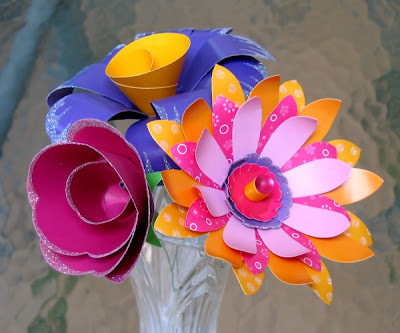 Very soon I am going to make a bouquet of these colorful paper flowers...charming indeed!